But it felt a little too cheesy. So you guys do know the movie Ghostbusters, right? You know, the one with Dan Aykroyd and Bill Murray and that famous Ghostbuster car? Yeah, well my memories of Halloween involve that car and the Gostbusters theme song. My grandparents live next door to the guy that owned the original Ghostbusters car. The very one that was used in the movie, the very one that Dan Aykroyd made very famous. Every Halloween the car would come out and hit all the school parades, take a few lucky kids for a ride and then during trick or treating it would come out just once and go up and down a few of the main streets. Everybody always had their eyes and ears wide open. You could hear the sirens a mile away and you knew it was coming. No one wanted to miss it since there was always candy flying out the widows. It made little old Rocky River, Ohio the place to be on Halloween night. Trust me, it was fun. Sadly, I heard Mr. Lintz sold the car (I even found this article when I typed Bob Lintz into google to check the spelling) but I am lucky enough to have the fun memories. Since my grandparents lived right next door I got to see my fair share of the car and also take a few extra tours through it. It was just fun and ghostly. Plus, I felt pretty darn cool being a kid in such a famous car. So every time I see ghosts, I always, always think of that car and the fun memories. And there is my trip down memory lane for the day. Come on, you have got admit, you are pretty jealous. No? Well then, you should be! I have actually never seen the movie. Nope, never seen it. Just been in the car. I should probably watch, huh? Is is good? Took me long enough, but I promise the wait was worth it. I mean, they are literally dripping in chocolate. Really though, how fun are these? Aren’t those little marshmallow ghosts so stinkin’ spooky? Ahhh, I just love them. 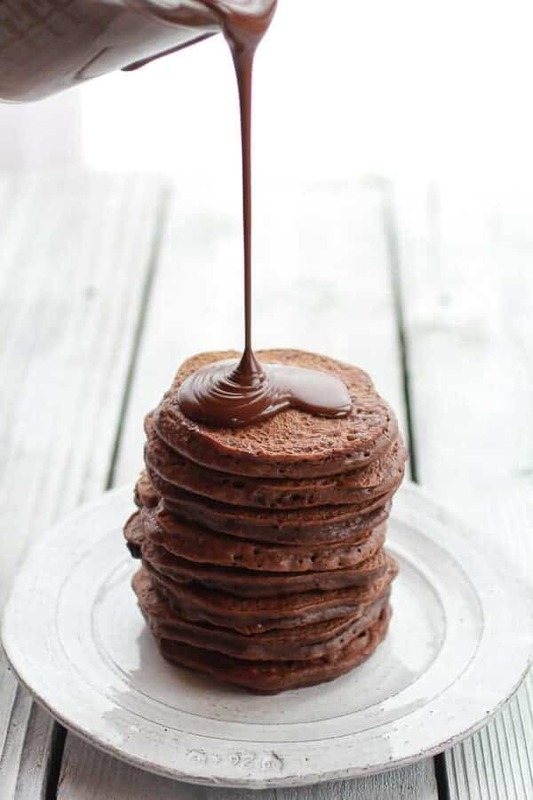 Ok and the all the chocolate dripping off this stack of fudge brownie pancakes. Fudge brownie. Not just brownie, fudge brownie. The combo of pumpkin and chocolate chips stirred into the batter makes these things gooey in the center and full of chocolate. Hence the “chocolate lovers” in the name. 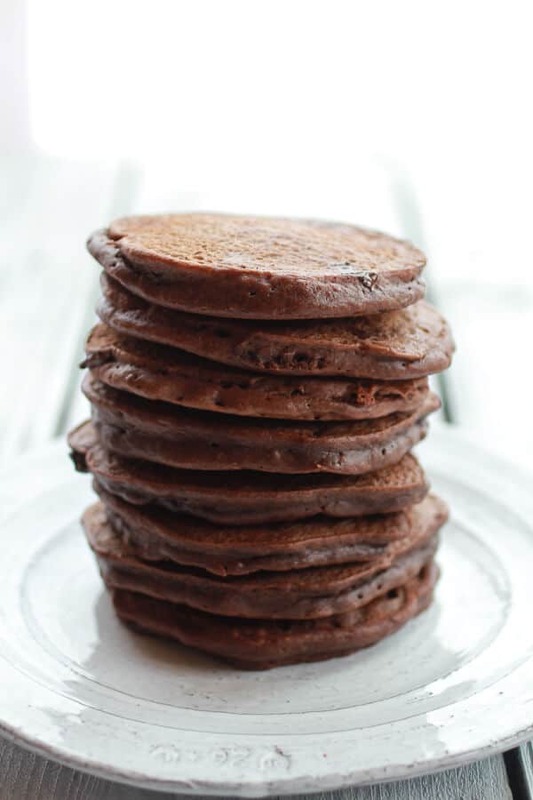 They are a true treat and I am not really suggesting they are breakfast (although I did still include them in the breakfast category of my recipe page), because well, they are still pancakes! 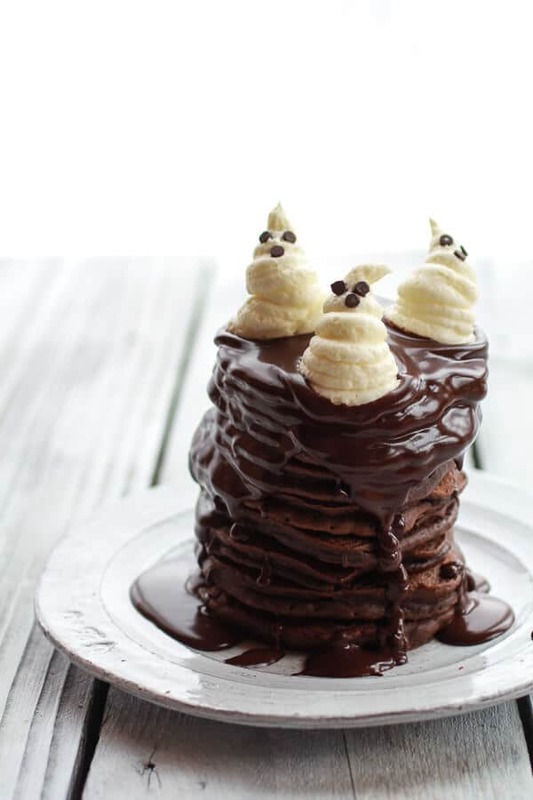 Just like most pancakes they are really quick and easy to throw together and the marshmallow ghosts are just some really easy, fluffy frosting that comes together in minutes. Just be careful when plopping the little ghost on top of the ganache. They are going to want to slide a bit, so I found it was helpful to let the ganache sit a few minute before adding the ghosts. This keeps the ghosts from sliding completely off the pancakes. But either way, they are going to come off and end up in the same place. Fudge brownie. Not just brownie, fudge brownie. The combo of pumpkin and chocolate chips stirred into the batter makes these things gooey in the center and full of chocolate. Hence the "chocolate lovers" in the name. To make the ghosts. In a bowl beat the butter and powdered sugar together. Mix until fluffy. Add marshmallow fluff and vanilla, and mix well. Fill a pastry bag fitted with a round tip with the marshmallow filling or just fill up a ziplock bag and snip off the end. Set aside. In a mixing bowl whisk together sugar and cocoa until well combined. Stir in flour, baking soda and salt. Make a well in center of dry mixture and set aside. In a separate mixing bowl whisk together 1/4 cup buttermilk, the egg, pumpkin, butter and vanilla. Pour wet mixture into dry mixture and mix to combine (don't over mix, batter should still have some lumps). If the batter seems too think add more buttermilk a tablespoon at a time until the right consistency is reached. Stir in the chocolate chips. Heat a large skillet or griddle over medium heat. Pour batter onto preheated skillet about 1/4 cup at a time and slightly spread batter in a circular form outward (so the centers aren't much thicker than the edges) and allow to cook until bubbles begin to appear on the surface, about 1 minute. Then carefully flip the pancake to the opposite side and cook until done. 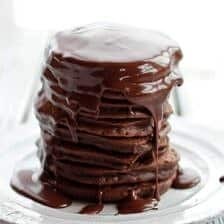 To assemble, stack your pancakes and drizzle with a little chocolate sauce. Let the sauce set for about 5-10 minutes and then pipe on a ghost or two. If you don't let the ganache set up a little the ghost will probably slide off. 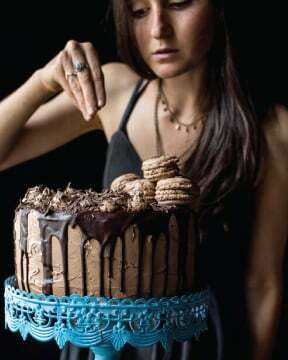 You can also just use a thin layer of ganache and the ghost probably will not slide off and you will not have to wait. Place two mini chocolate chips on the ghost for eyes. Make sure to keep the ghost towards the cent of the pancakes, they will slide on the warm pancakes and sauce. Serve! To make the chocolate sauce, In a microwave safe bowl add the chocolate chips and butter. Microwave on 30 second intervals, stirring after each until the chocolate is melted, this took me only 1 minute. You may also melt the chocolate in a small pot over the stove. Once melted stir in the heavy cream or canned coconut milk and Kahlua, stir until the sauce is smooth. Allow to cool 10 minutes before pouring over pancakes. 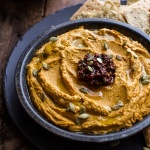 Spicy Chipotle Pumpkin Hummus + Halloween Links. Where do I begin. Again….SO CREATIVE! 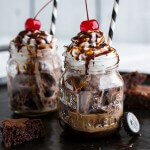 Chocolate-kahlua sauce. I would like that on everything. And those little ghosts…SO CUTE! My daughter would love those. I would love the sauce. 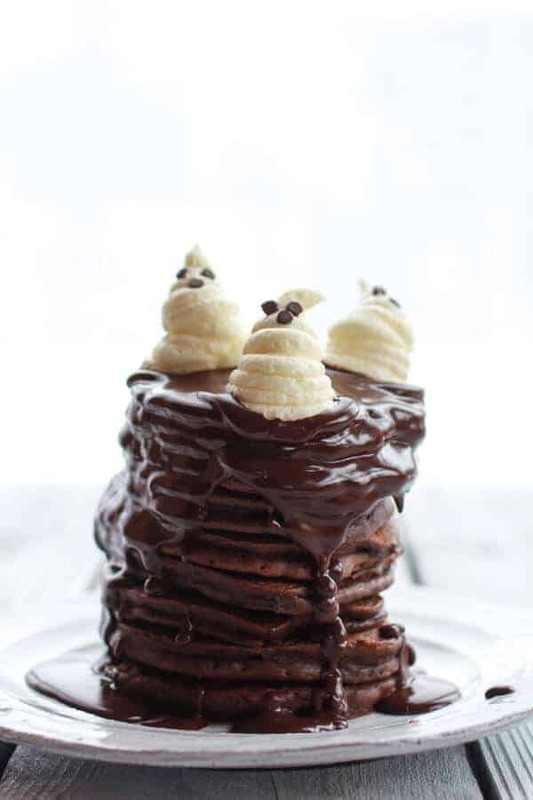 And the pancakes themselves – yes pumpkin + chocolate come together usually in a very fudgy way! Pinned! DUDE – you are SO LUCKY, having that Ghostbusters car next door to your house! You have to see the movie! It’s so awesome – Bill Murray at his finest. 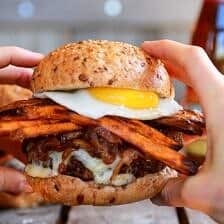 Sit down with some of these bad boys and get it done! I have to watch the movie! Is that the same guy in Ohio who also owns the Bat Mobile and the Rocket Car? Those pancakes are SO fun and delicious-looking. No, I have never seen those ones!! Just the Ghostbusters car! Those little ghosts? I can’t even stand it! Too cute for words. They would be wonderful for a Halloween brunch! I just love pumpkin and chocolate together. And now I’m craving pancakes for breakfast. So cute! They sound downright delicious. Chocolate is my best friend. So these are my kind of pancakes! What a fun and festive masterpiece, Tieghan! 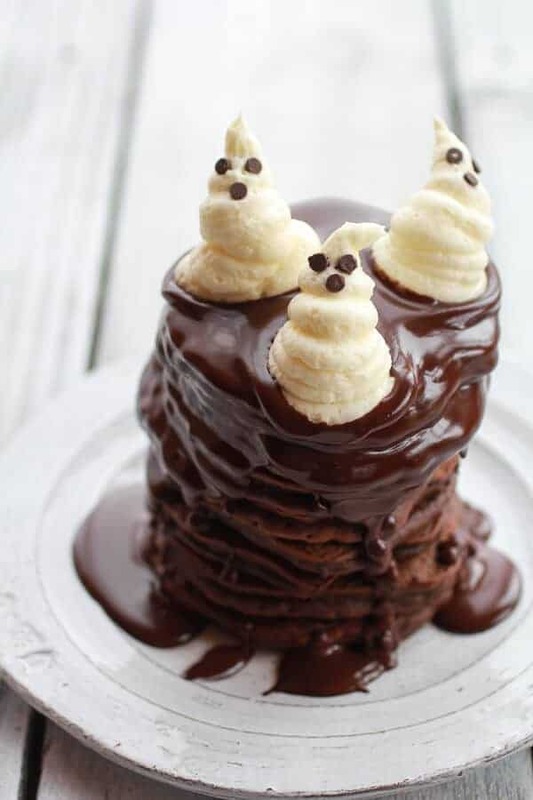 Perfect for Halloween with all those little ghosties on all that dripping dark chocolate sauce! I’m with Sally…perfect for Halloween brunch with a hot cuppa or very tall glass of milk. So cool that you were able to ride and enjoy candy being thrown from the Ghostbusters car each Halloween growing up! Thanks for sharing a little bit of memory lane and this wicked recipe, girl. Pinning! How adorable! I really wish I had nieces and nephews so I could make cute stuff like this! This dish looks festive and delicious! These are absolutely adorable, Tieghan! BRAVO! Ghosts. Chocolate. 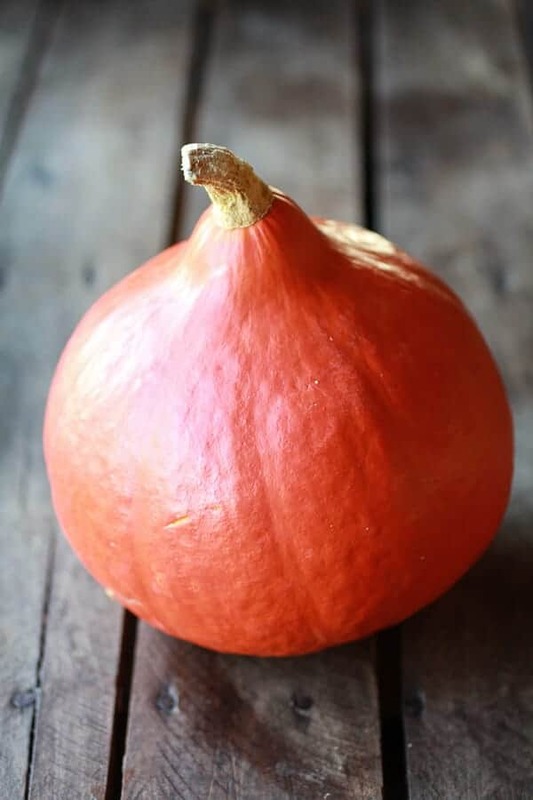 Pumpkin! Yeah I’d say these are the official pancakes of October!! I am dying for a bite. Can’t get over those marshmallows. Fairly positive I could devour the entire stack! I love you and all, but why did you do this to me?! LMAO! Hahahaha, I would not be able to be trusted in a room with these! Beautiful and decadent. I would save this for desert though, may give me a stomach ache early in the morning. 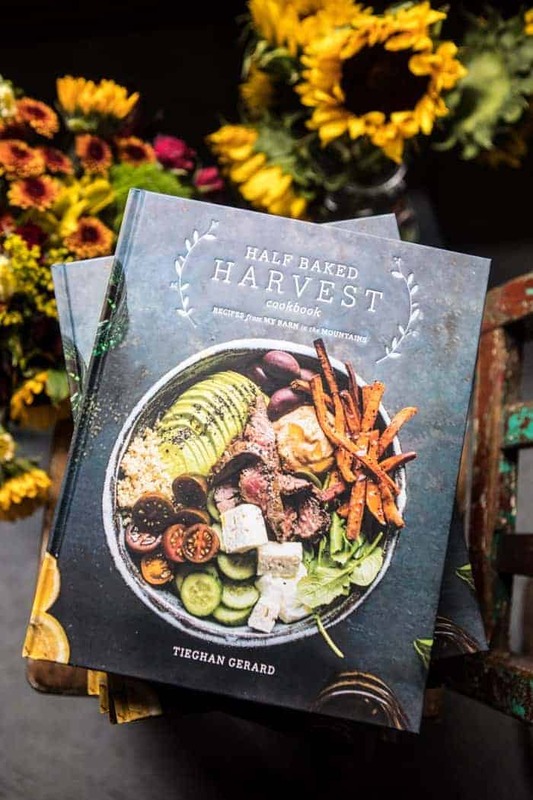 Tieghan – you never fail to amaze me with your creations!!! This is amazing and I want a plate full of these cuties!!! Haha, your little ghosts are so cute! These pancakes look awesome and so unbelievably amazing. 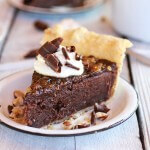 Is it possible to die from a chocolate overload? I hope not! WHOA! These are crazy amazing! and yeah, I’m jealous…and yeah, maybe I was singing the theme song to Ghostbusters last night and basically anytime any one says “Who are you calling?” Cause I just can’t help myself. Also, the word “spooky” will launch me into singing Werewolf Bar mitzvah. Cheesy, yes, necessary…absolutely. I can make a legitimate argument to eat these for breakfast? I am so there! 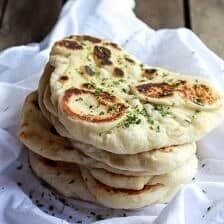 These look amazing, Tieghan. Ghostbuster was [is still] my favorite movie growing up!! I’m sooo jealous!!! These look incredible, and I’m especially in love with that final shot. 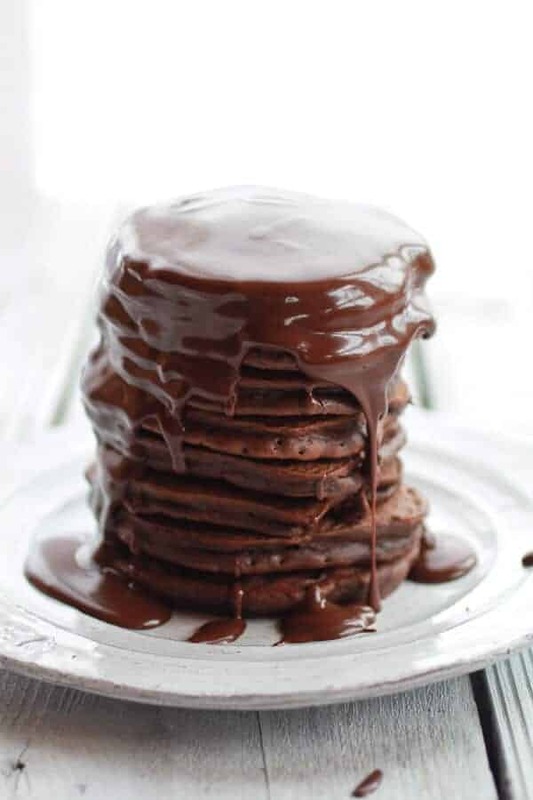 Pancakes dripping in anything are delicious, but chocolate makes them even better! Those are making my mouth water. Nice work! Ohhhh, yummy. Saw this, pinned it and making it soon. Very nice. Hah! Yes and thank you!! Hope you love them! 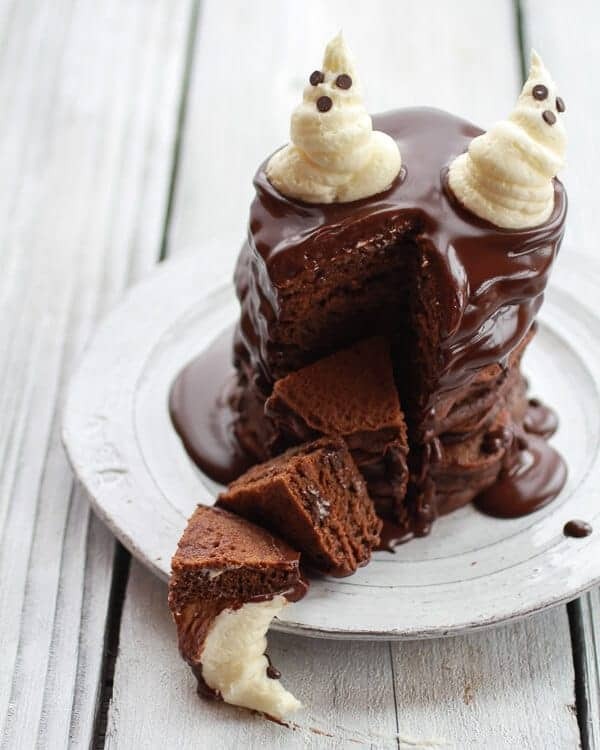 Please pass me a spoon for that dripping chocolate sauce – these are incredible! wow, they look delish! love the ghosts! Too, too cute. Love these pancakes! And I would have died of pure awesomeness if I got to ride in that car, seriously. I can hardly for words! So much heaven in one plate! And this seriously couldn’t be a more picturesque towering of spooky perfection. OH MY GOSH, Tieghan, stop it! You’re killing me with flavor and cuteness! These sound soooo good. I want these for breakfast probably every day for the rest of my life. Hehe! Thank you so much, Erin! Your photography gets better with each post! I love it! 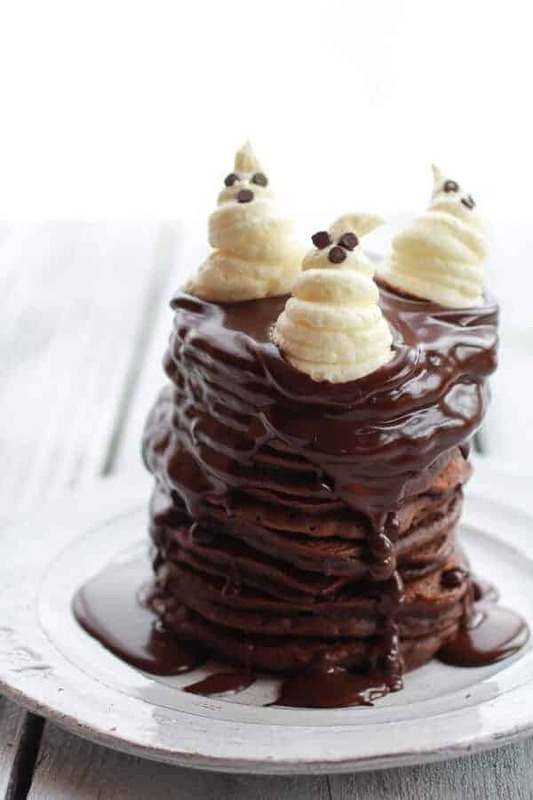 Gorgeous pancake stack! 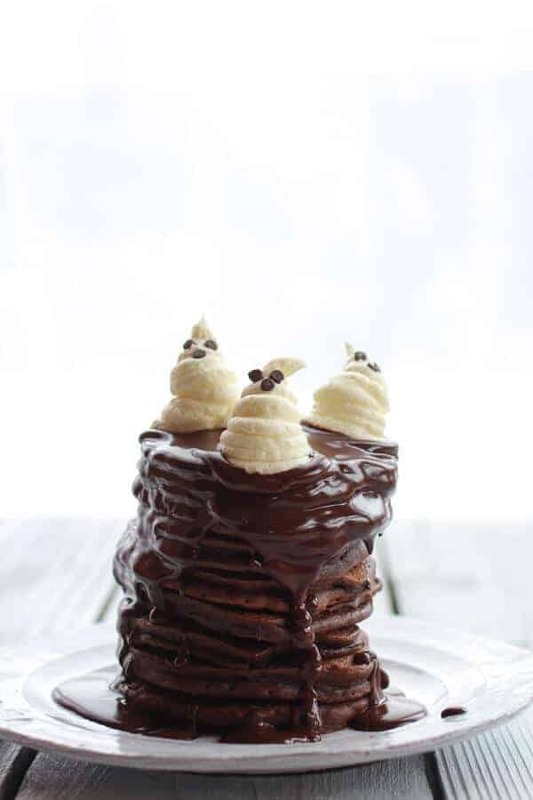 You had me at pancakes.. but these are too much! Gorgeous! Wow – totally jealous you grew up with the Ecto-1! I had a friend with the toy version – good but not as good. We were fully channelling Ghostbusters for our last (and first shoot). It’s that time of year. How cool is that! You should watch the movies whilst eating Halloween sweets, it would be fun! 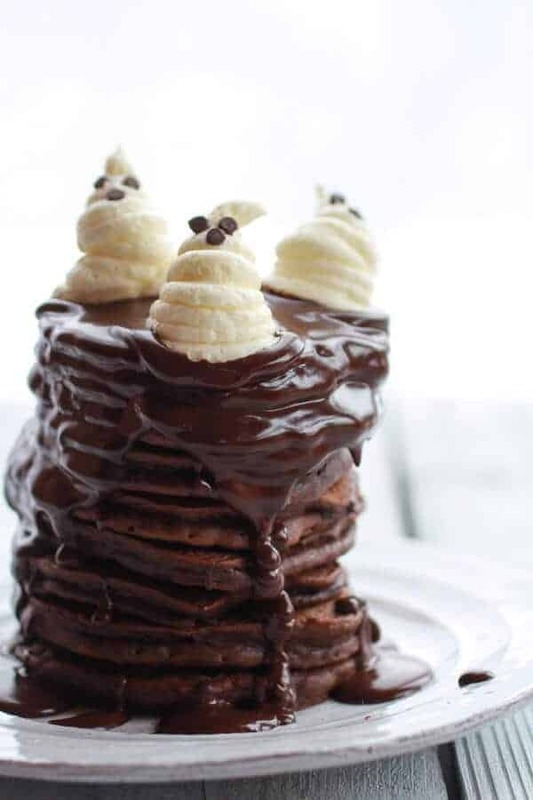 Pancakes look amazing!! I could dig right in. 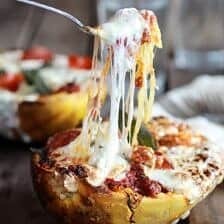 Those look amazing & I loved hearing the story. That is my all time favorite movie & as a result I can probably recite every line from every scene. 🙂 Sort of sad & pathetic but I watched it a lot at a teen. Haha! Thanks so much, Gina! Booooooom shakalaka! When I finally pass, I hope I fall head first into a giant stack of this gloriousness. 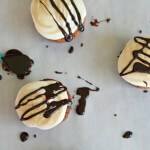 Those little ghosts are so stinkin’ cute, but personally, I can’t get over the chocolate kahlua sauce. My gawwwwwwsh YES. I totally just got immersed in your blog. So glad I found it! 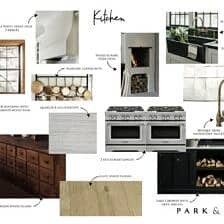 So many things I want to make! YAY!! Thank you so much!! So happy you are liking my site!! Let me know what you try! I dont like pumpkin, so I’ll leave that out, but these sound like something I wanna to make in like…12 hours, lol. Brownie Breakfast! I’m confused on the sauce ingredients. No butter is listed in the sauce ingredients but instructions say to melt chocolate chips and butter. Which is correct? and if I do need to melt chips with butter, how much butter.